What are Sugar Alcohols and How are They Different from Sucralose? Imagine seeing a listing for a “jumbo shrimp cocktail” on a menu for the first time. You might think it’s a huge drink made from shrimp based on the definition of each word. But anyone who has ever enjoyed this special appetizer of chilled shrimp and a horseradish-based sauce knows it’s not! Similar confusion arises when people see the term “sugar alcohol” for the first time. Some think it’s a sweet alcoholic beverage but in fact it’s another sugar substitute. Explaining the difference between two types of sugar substitutes – sugar alcohols and sucralose (the sweetening ingredient in SPLENDA® Sweeteners) – is what this blog is all about. What is a Sugar Alcohol? The best way to define a “sugar alcohol” is to tell you what it is not. A sugar alcohol is not a sugar like sucrose or glucose and it is not alcohol like the type found in beer, wine and whiskey. Sugar alcohols include erythritol, lactitol, maltitol, sorbitol, xylitol, isomalt, and mannitol, and they are carbohydrates with a structure that partially resembles sugar and partially resembles alcohol. They are also known as polyols and occur naturally in many foods, including apples, watermelon and mushrooms. Sugar alcohols, or polyols, taste sweet, but are not as sweet as sugar. They also have fewer calories per gram than sugar and are used in a variety of reduced-calorie and sugar-free foods. One of the best qualities of sugar alcohols is that they do not contribute to the formation of cavities so they are used in place of sugars in products like chewing gum, toothpaste and mouthwash. How are Sugar Alcohols Different from Sucralose? If you compare sugar alcohols to sucralose (SPLENDA® Brand Sweetener), you will find that there are many differences even though they are both classified as sugar substitutes. One difference between sucralose and sugar alcohols is that sucralose alone has no impact on blood glucose and insulin levels. Like other no-calorie tabletop sweeteners, the sucralose-based sweeteners you buy at the store contain small amounts of carbohydrate (less than 1 gram per serving) that provide needed volume and texture. These common food ingredients, which include maltodextrin and/or dextrose, add minimal carbohydrate and sugar per serving. In contrast, sugar alcohols are considered a type of carbohydrate and sufficient intake could have an impact on blood glucose levels. Sugar alcohols also should be considered in carbohydrate counting. You can get good advice on sugar alcohols and how to factor them into the total carbohydrate content listed on food labels by reviewing Hope Warshaw’s blog Reading Nutrition Labels for Total Carbohydrate. Another important distinction to note when comparing sucralose to sugar alcohols has to do with gastrointestinal disturbances. Research shows that sucralose has no side effects. Sugar alcohols are different. They have the potential to cause a laxative effect when consumed in excess and can be an unsuspected cause of cramps and gas for anyone consuming large amounts of products like sugar-free gum, candies or desserts made with polyols. That can be especially troublesome for children and people suffering from Irritable Bowel Syndrome. 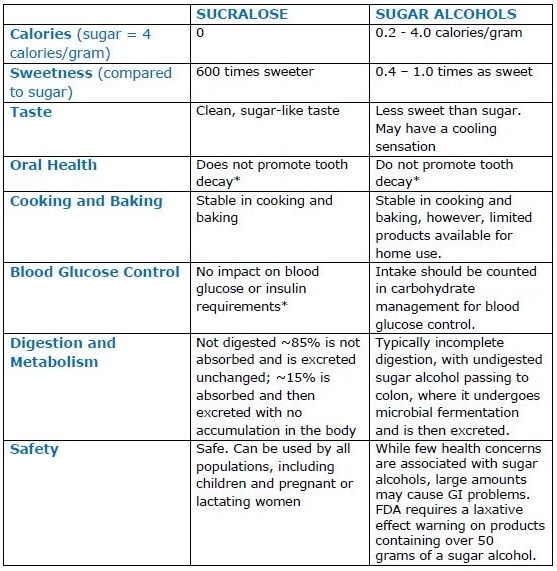 To see the differences between sugar alcohols and SPLENDA® Brand Sweetener (sucralose), just use the handy chart below. *Note: Other ingredients with which they are combined may have an effect. Is Your Diarrhea a Sign of a Food Allergy? If you experience occasional diarrhea, it could be caused by a food allergy or food intolerance. Most people connect food poisoning with diarrhea, but that is not always the case. A true food allergy is an abnormal response to a food triggered by the immune system. Research shows that around 3 to 4 percent of people have food allergies. The first sign of symptoms may be within minutes of coming into contact with the problem food – meaning you may have simply touched it, not consumed it – or several hours later. If you have a true food allergy will cause a reaction every time the food is consumed. The diagnosis may require a combination of lab tests, physical exam, thorough diet history and a controlled food challenge. 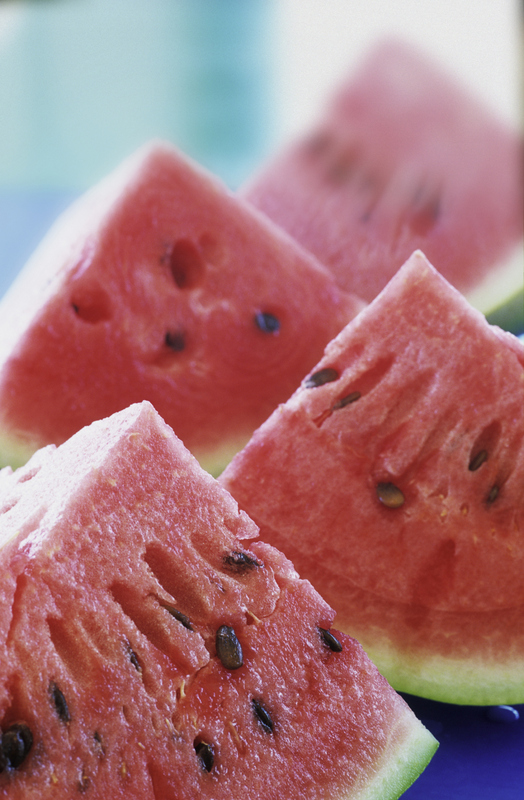 These eight foods account for 90 per cent of all food allergic reactions. Food intolerances can also result in diarrhea. They are triggered by the inability to completely break down or digest a food. 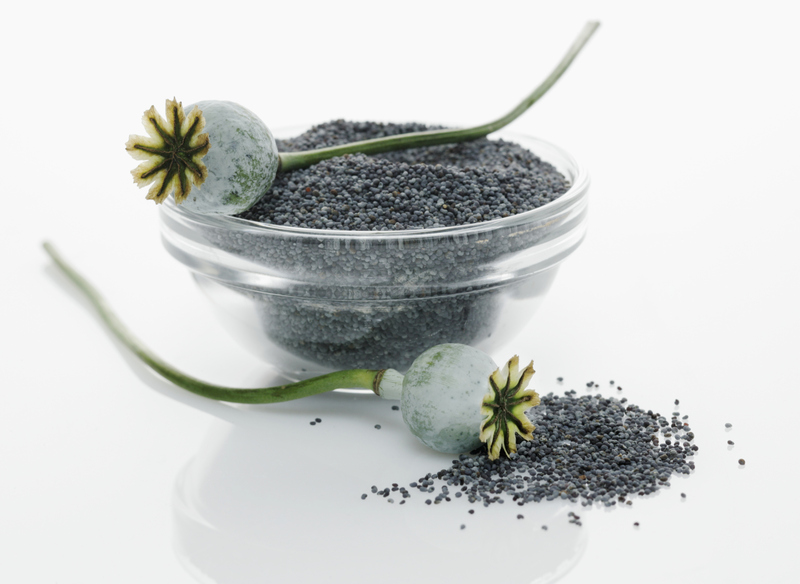 Small amounts of a suspect food may be tolerated without difficulty, while larger amounts will bring on symptoms. It may take some trial and error testing to determine if you have a food intolerance. The same types of symptoms can occur with a food intolerance as those experienced with a food allergy. The key is to figure out which food(s) are responsible for your symptoms and how much, if any, you can tolerate if you’re unwilling to give up the food. This post was written as a guest blog for SplendaLiving.com on September 2, 2014. You can read the original post here. Can a freshly roasted turkey make you sneeze? If you had asked a friend of mine a few years ago you would have heard a resounding “Yes!” He then would have offered as evidence that he always started to sneeze the minute he sat down for his family’s Thanksgiving dinner. The problem with his “evidence” was that it was anecdotal. That means it was a personal account of something that happened to him that was not based on research and was not necessarily true. In this case, his sneezing had nothing to do with the turkey. As he later learned, he had an allergy to sunflowers and his sneezing was triggered by the floral centerpiece that graced their dining room table every Thanksgiving! Unfortunately, there is a lot of other anecdotal, or self-reported, information out there that gets passed off as evidence of a problem when scientific research indicates the “problem” is not, in fact, a real one. Many symptoms, like sneezing, are so common, almost anything can be the cause. But when the wrong connection is made between something and a personal response, it can set in motion a myth, like my friend’s mistaken turkey-and-sneezing connection. Low-calorie sweeteners is a topic that has been particularly subject to misinformation that has led to myths. This is worrisome, because some people still ask: “Is sucralose bad for you?”, and “Are there sucralose side effects?”, even though the total body of evidence shows they are safe and without side effects. Since these myths are nothing to sneeze at, I’d like to set the record straight here! If you eat and drink a varied diet you may occasionally experience gas, bloating and changes in your bowel habits. That’s normal digestion at work. Even if you eat the same thing every day, changes in your emotions can impact how well you digest your food. Given the high-stress lives many people lead today, it’s important to remember that, before blaming something you’ve eaten for your stomach rumblings. The good news is sucralose has not been found to cause digestive problems (see Fact vs Fiction: Sucralose Dangers and Side Effects). Data from over 100 studies show sucralose has no side effects, but that news may not have reached all of us who are trying to eat wisely. Instead, we tend to hear more alarming news about studies whose results contradict the available research. For example, some of the digestive health myths about sucralose stem from a small study in rats done in 2009 that was actually found to be unreliable by experts. One of the most common allergy-related myths associated with SPLENDA® Sweetener Products has to do with corn allergies, since dextrose and maltodextrin are used as bulking ingredients in SPLENDA® No Calorie Sweetener Packets and Granulated. People with a diagnosed allergy to corn should be able to use SPLENDA® Sweetener Products without any problem. It is the protein in certain foods that usually triggers allergic reactions, and all of the corn-derived ingredients in SPLENDA® No Calorie Sweetener Products come from the starch fraction of corn. Since it is highly purified it should not contain any appreciable amount of protein. If there is concern, a good option is the SPLENDA® No Calorie Sweetener, Minis, which do not contain any corn-derived ingredients. As for other allergies or food intolerances, anyone who has a medical condition making it necessary to avoid certain ingredients in the food supply must be vigilant about reading labels. Fortunately all of the ingredients in SPLENDA® Sweetener Products are ones that research does not associate with allergic response, and they are all listed on the packaging. You can also call the SPLENDA® Consumer Care Center at 1-800-777-5363, or visit SPLENDA.com for more information. If you do an Internet search for “causes of headaches” you’ll get nearly 30 million hits! Counting them all would give anyone a headache, but I’m sure there are people scanning those lists eager to find the cause for their misery. Yet with so many possibilities, it’s easy to jump to the wrong conclusion, especially when anecdotal information is involved (see point #1 above). If you believe sucralose can cause headaches, relief is on the way. Scientists have conducted numerous studies to determine if sucralose causes side effects and concluded it does not. Research shows that sucralose has no side effects, and is not linked to any known triggers of headaches. Of course, other ingredients people may be sensitive to might be found in a food or drink sweetened with sucralose, so individuals should carefully evaluate everything in their diet when considering possible causes for headaches. It’s also important to remember that headaches are one of those common complaints that can be caused by non-dietary factors, like stress, worrying, and changes in our environment, which can be frustrating for those who suffer from headaches. It’s good to know the best scientific evidence available tells us there are no side effects from sucralose, so if you hear rumors about them, don’t be misled by anecdotal information. Instead, check out the facts on Snopes.com (make sure you read the Snopes.com response, past the “example” provided) – and lay the myths to rest! This post was originally written during my 2 1/2 year tenure as a blogger for Health Goes Strong. This site was deactivated on July 1, 2013, but you can read the post here. CAN A LOW FODMAP DIET HELP CONTROL IRRITABLE SYNDROME? When I first saw the word FODMAP a few years ago I thought it was a misspelling of the word foodmap. Even with that misinterpretation, I had no idea what foodmap meant, either. Then I started to see a lot more mentions of FODMAP and realized it wasn’t a typo. There was a food story here and I was prepared to follow its trail to see where it took me, map or no map. If you like culinary excursions, this is a journey worth knowing about. This string of letters is an acronym for the words Fermentable Oligosaccharides Disaccharides Monosaccharides And Polyols. They represent specific types of sugars and carbohydrates commonly found in foods. Why are FODMAPs getting attention? Some people have difficulty digesting or absorbing these substances, which can lead to gastrointestinal (GI) problems when they pass into the large intestines and are fermented by the bacteria normally found there. This fermentation can cause gas, bloating, cramping, diarrhea and other gastrointestinal distress. Which sugars and carbohydrates are FODMAPs? The oligosaccharides include carbohydrates classified as fructans and galactans. Fructans are found in a variety of vegetables, cereal grains including wheat and rye, and the soluble fiber called inulin. Galactans can be found in canned beans such as baked beans and kidney beans, plus dried beans, peas and lentils. The main disaccharide on the list is lactose. It is found primarily in milk products from cows, goats and sheep and is used as an additive in other foods. Fructose is the main monosaccharide identified in FODMAPs. It is naturally found in honey and most fruits, especially dried and canned fruits and fruit juices where it is concentrated. It is also in the sweetener high fructose corn syrup. Polyols are naturally occurring in many fruits and vegetables and are found in sugar substitutes such as sorbitol, mannitol, maltitol, xylitol and isomalt. Who might be a candidate for a low FODMAP diet? People who have been diagnosed with irritable bowel syndrome (IBS) and inflammatory bowel disease are often recommended to use this diet to relieve their symptoms, along with anyone who has unresolved GI problems and suspects they may be sensitive to one or more FODMAPs. The first step is an elimination diet trial to see if your symptoms are triggered by FODMAPs, and if so, which ones. This involves removing all sources of FODMAP foods for one to two weeks to see if the symptoms disappear. If they do, the FODMAPs are gradually reintroduced, one category at a time, to see which ones are tolerated and which ones cause problems for you. How strict must you be on a FODMAP diet? After the elimination diet trial, you know which foods you don’t digest well. You may find you can tolerate certain ones in small quantities, but not several different ones in the same day. The goal is to have as varied a diet as possible without suffering from the side effects. Where can you get help with a FODMAP diet? It is very important to work with a FODMAPs trained registered dietitian who can develop a personalized food plan that insures all of your nutritional needs are being met once the offending foods are removed. This diet should not be attempted without professional advice since there is no simple list of foods high in FODMAPs, so you may continue to eat products containing them and have symptoms without realizing why. Is Diarrhea a Sign of a Food Allergy? Which Foods and Fibers Can Prevent Constipation? If you want to reduce your weight, lowering your caloric intake is an option. If you want to reduce your risk of gallbladder attacks while losing weight, don’t lower your caloric level too far. Crash diets have been proven to increase gallstone attacks. A new study from researchers in Sweden followed 6,640 people for one year who were losing weight on diets with different caloric levels. The “crash diet” included liquid meals providing 500 calories a day for six to 10 weeks. After that phase, those dieters gradually resumed eating solid food and followed a maintenance diet for nine months with an exercise regimen. The other dieters followed a “low calorie diet” with between 1200 and 1500 calories a day for the first three months. It also included two liquid meals a day, then transitioned to a weight maintenance diet of all solid food for the next nine months. As reported in the International Journal of Obesity, 48 people on the crash diet developed gallstones requiring hospital treatment while only 16 people in the low calorie group did. One reason offered for this difference in gallstone attacks is that the people on the crash diet lost more weight. They had an average loss of 30 pounds at three months compared to 17 pounds for the low calorie group and an average loss of 24.5 pounds at the end of one year compared to 18 pounds for the others. Even though obesity is a risk factor for gallstones, losing weight too quickly just makes the problem worse. The gallbladder’s function is to hold bile, a liquid made in the liver, and release it during digestion when needed to help breakdown fats. Bile contains water, bile salts, protein, bilirubin (a waste product), cholesterol and fat. The most common type of gallstones is made from cholesterol. When there is too much cholesterol in the bile it can harden into small pebble-like substances – or stones. During rapid weight loss the liver secrets extra cholesterol into the bile, and that can increase the risk of gallstone formation. It is also believed gallstones are formed when the gallbladder does not empty completely or often enough, which is the case when eating a very low fat diet. Bile travels through ducts, or tubes, to get from the liver to the gallbladder to the intestines. If there are stones in a bile duct that block the flow of bile it can cause inflammation. That can lead to the fever, jaundice and the pain commonly associated with a gallstone attack. Gallstone attacks typically occur after eating a meal and can mimic signs of a heart attack, so getting a proper evaluation is critical. If your pain is in your lower back, see my post about kidney stones to see if they are a problem for you. This post was originally written during my 2 1/2 year tenure as a blogger for Family Goes Strong. The site was deactivated on July 1, 2013, so the post has been reproduced here. If you or someone in your family is on a gluten free diet, then you know how hard it is to find something to eat when you’re in a hurry and hungry. Even though there are more gluten free items in stores and on menus than ever before, they’re hard to spot when you really them. At least that’s what I’m told by people who are trying to avoid gluten. They say eating healthy meals and snacks is easy when they plan ahead, shop regularly and prepare or pack their food for the day, but that doesn’t always happen. Of course, the rest of us can always grab something to eat on the go from a vending machine, at any checkout counter or the drive-up window of a quick service restaurant. But if you must steer clear of all wheat, barley, rye and oats, it’s another story. The best way around this dilemma is to keep a supply of portable, non-perishable, single-serving gluten free snacks on hand wherever you spend a lot of time, like your job or the car. A trip to your local supermarket or specialty food store is the best way to stock up on your favorite gluten free products or by placing an order online. It also helps to know what you can buy when you’re out and about and forgot to tote your own. Fortunately, there are many gluten free foods as close as the neighborhood convenience store, chain drug store, or even the corner Starbucks – a great place to find KIND bars. Just reach for a piece of fresh fruit or single-serve fruit cup, some sliced or string cheese, or a raw vegetable and dip combo for gluten free munching. There are also some national brands you can count on for gluten free options right alongside the other crunchy, crispy and chewy snacks on the shelves. In honor of Celiac Awareness Month, I have 10 recommendations to help you with your search for gluten free snacks. Just be sure to check the ingredient list on all packaged foods before making your purchase since manufacturers can change their formulations at any time. KIND all natural whole nut and fruit bars that deliver the perfect combination of protein, carbs and heart healthy fats to keep you feeling fuller longer. Blue Diamond single or mixed nuts sold raw, dry roasted, or seasoned for naturally gluten and wheat free munching. Quaker rice cakes made from white or brown rice for a snack that can be sweet, salty or savory. Indiana Popcorn FIT bagged popcorn for a whole grain snack from non-GMO corn. Frito Lay white, yellow and blue tortilla chips in different shapes suitable for dipping. Kettle brand potato chips that are baked, reduced fat or fried in more than 15 flavors. General Mills Rice and Corn Chex cereal you can eat right from the box or add to a custom trail mix. Sun Maid raisins and other dried fruit that deliver natural sweetness with no added sugar. Welch’s chewy fruit snacks and fruit ‘n yogurt snacks for a fat free fortified snack. Confused about who should be on a gluten free diet and why? Read my Q&A on gluten free eating here. 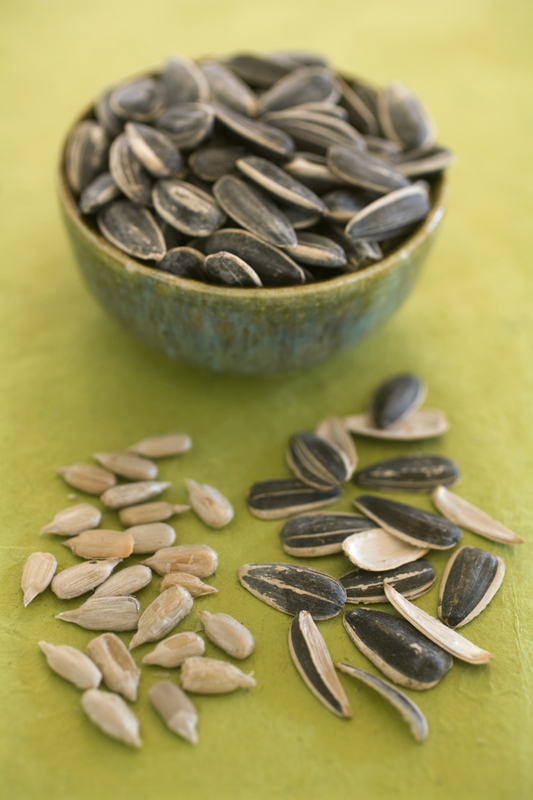 Seeds aren’t just good food for birds, there are many health benefits of seeds for people, too! They are high in many essential minerals and vitamins, a source of polyunsaturated fatty acids, provide protein and fiber, and are low in sodium. 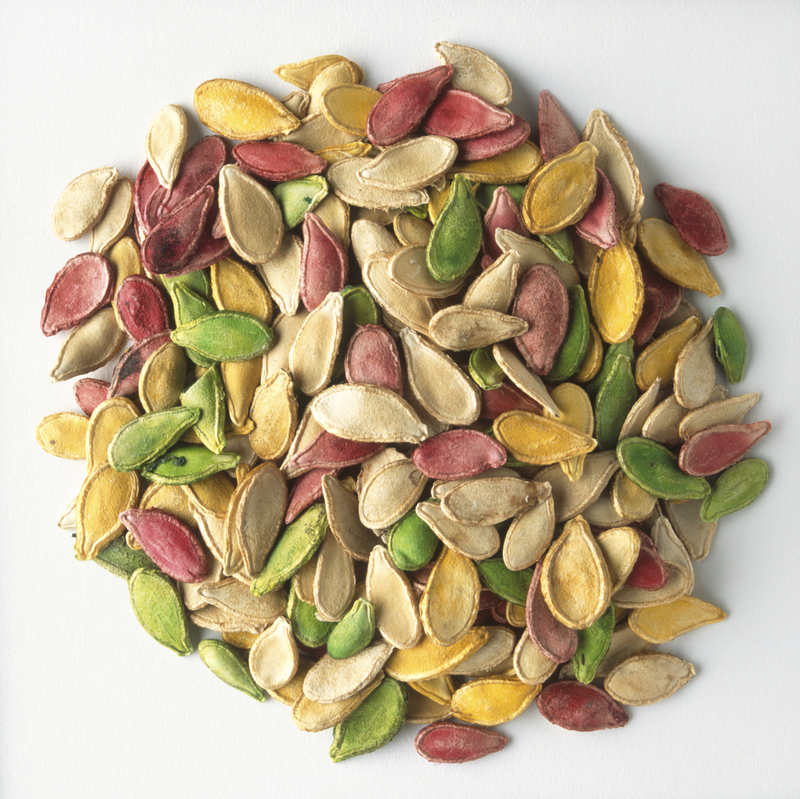 Those who are allergic to tree nuts can use edible seeds to add crunch to their trail mix and texture to baked goods. They can also enjoy seed butters in place of nut butters. 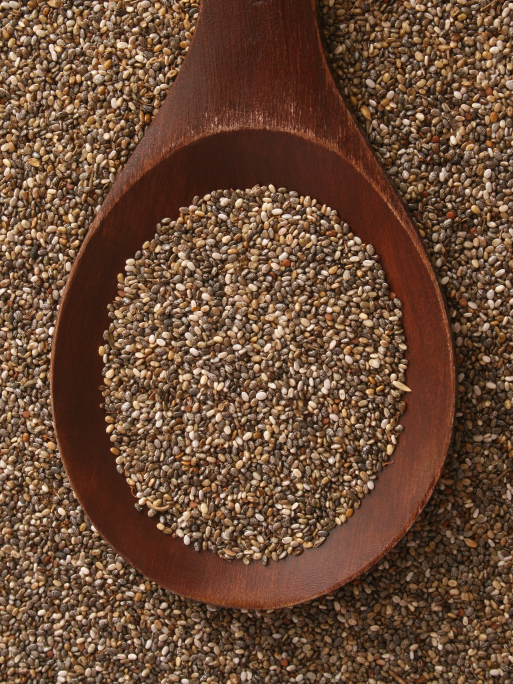 Adding more healthy seeds to your diet is as easy as sprinkling them on your next bowl of salad, cereal or stir fry. They’re the highest in protein with 8.5 grams per ounce. Save them when carving your next Jack-O-Lantern to roast in the oven and sprinkle over some pumpkin soup. One of the richest plant sources of ALA Omega-3 fatty acids, plus you get the benefits of both soluble and insoluble fiber. You can find them ready-to-eat in KIND brand Vanilla Blueberry Clusters with Flax Seeds and Cinnamon Oat Clusters with Flax Seeds. Swallowing them won’t make a watermelon grow in your belly, but will provide you with a good source of protein, so go ahead and add them your fruit smoothie right along with the sweet and juicy fruit. Loved for their licorice flavor, they’re widely used in candies, confections and alcoholic beverages. One tablespoon has 14% of the Daily Value for iron, or 2.48 mg.
A little bit goes a long way with 13% of the Daily Value of calcium in every tablespoon, along with some iron, copper, potassium and magnesium. Their crunch can be found on breads and rolls, in noodle dishes, and fillings for pastry. 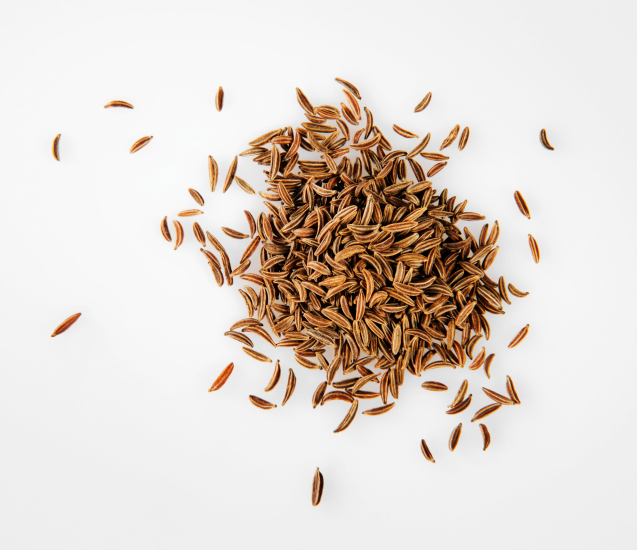 One of the edible seeds with the highest monounsaturated fatty acid content at 5.5 grams per ounce and many phytonutrients with antioxidant properties. Their nutty flavor is best appreciated when made into tahini and used on falafel. 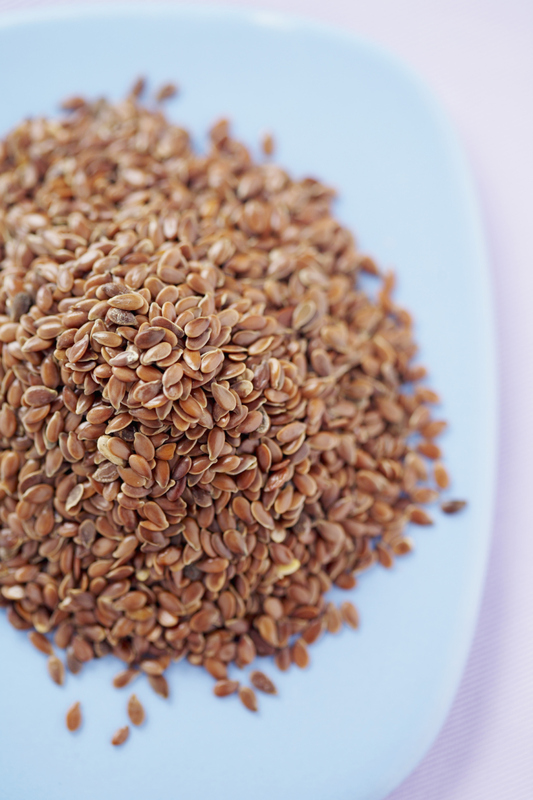 Similar to flax seeds, but they don’t have to be ground in order for us to absorb their nutrients. Eating them whole allows them to absorb water and swell to ten times their weight, providing a sense of fullness. 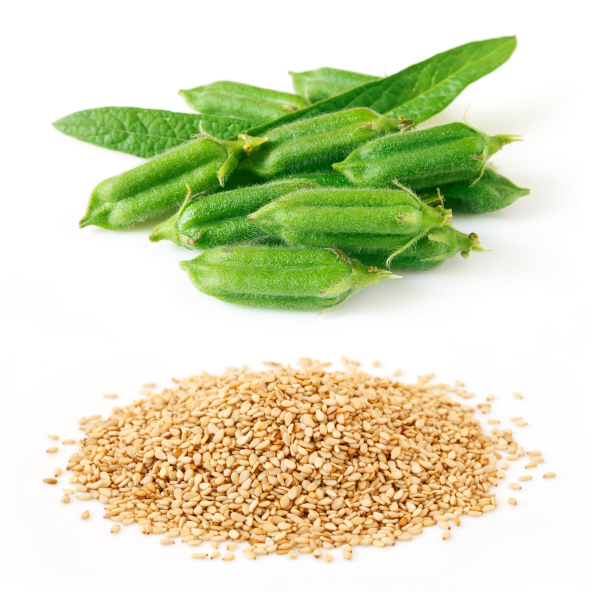 Not just for baseball players, you’ll find plenty of sesame seeds in Somersault snacks and can harvest them from your sunflowers to roast and hull for your own sunflower butter. 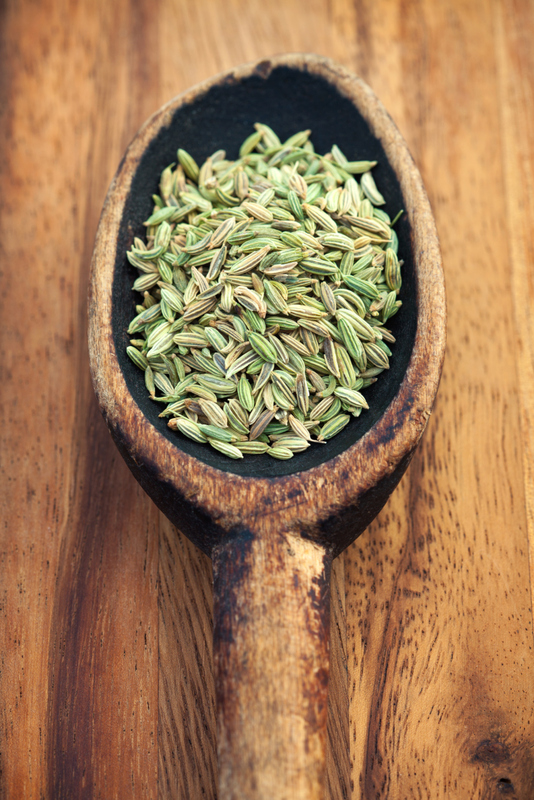 Every tablespoon provides 1 gram of fiber while also being a source of natural anti-flatulence compounds. 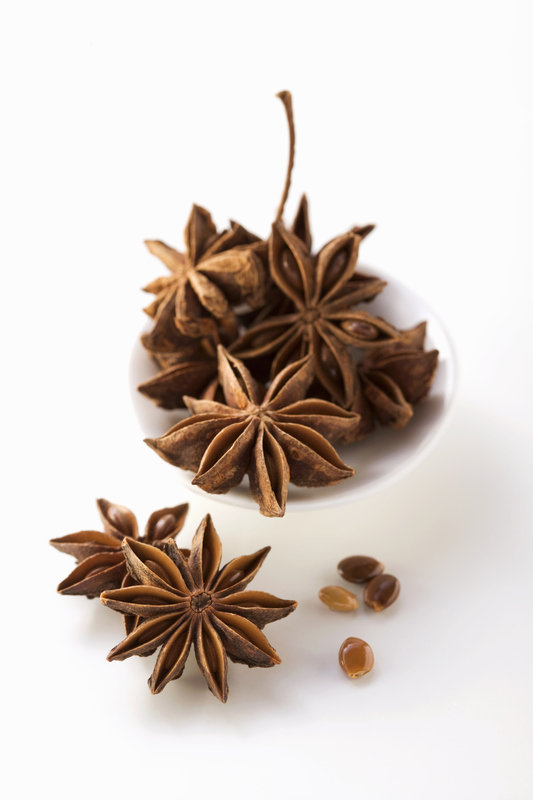 They have a licorice scent and taste and are used in cooking everything from Italian sausage to Indian curry.